1. Place the raisins and sultanas into a bowl and pour over the orange liqueur.Cover the bowl and set aside for 24 hours to soak. 2. Preheat the oven to 150°C, gas mark 2. In a large bowl, cream together the butter and sugars, then add the eggs one at a time. If mixture looks like it is going to split, add small amount of flour. 3. Melt the chocolate in a bowl over hot water, then add to the creamed butter mixture. Add the flour, mixed spice, cinnamon and nutmeg and stir. Add the lemon juice and orange liqueur, and mix together. Gently fold in the soakedvraisins and sultanas, mixed peel, cherries, walnuts and hazelnuts. 4. Spoon the mixture into a greased and lined 22cm springform cake tin. Bake the cake for 2½ - 3 hours. Test whether the cake is cooked by inserting a skewer - if it comes out clean the cake is done. Cool on a wire rack, then brush with more liqueur and wrap in cling film until ready to decorate. 1. Brush the cake with the hot apricot glaze. Roll out the marzipan to a thickness of 3mm and cut to a perfect circle to fit the top of the cake, using the cake tin base as a guide. Place the marzipan circle carefully on top of the cake, then brush it with a little hot water. 2. Roll the icing to a 5mm thickness and it into a circle to fit the top of the cake, again using the cake tin base as a guide. Place on top of the marzipan. 3. 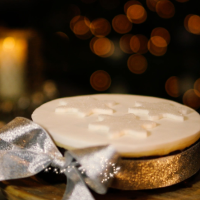 To make the snowflakes, roll the remaining fondant icing to a 2mm thickness and using a snowflake cookie cutter, cut out three snow flakes and sprinkle with silver stardust. Brush a little water onto the cake where you'd like your snowflakes to be, then gently press into place.